Chastain was a rather singular band as 80s heavy metal went. Chastain was the personal project of guitar virtuoso David Chastain, who was nonetheless content to stay mostly in the rhythm section and keep his fancier work to a minimum for the benefit of the song structure. Though his guitar was phenomenal and his songwriting above average, the secret ingredient on the albums of their heyday over 20 years ago was singer Leather Leone, whose rough voice was compared sometimes to a female version of Metal Church's Mike Howe. Despite the change to a new frontwoman in the 90s, Chastain was a band almost every fan associated first with Leone, and then with the namesake and founder. 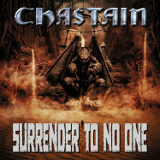 The big selling point of Chastain's new LP, Surrender To No One, is that she's back, and now apparently assisting in some of the songwriting according to press releases. At first listen (especially when I first heard the ridiculously bad 20-second teaser samples from the tracks, samples which seem scientifically engineered to put each track in the worst possible light and discourage buyers), my first thought was, Oh no! Leather's voice has not aged well at all! This is going to be a disaster! And it must be admitted that her voice, always pretty harsh even in her younger days, has gotten a lot more of a grating sound in it and lost a little of its strength, especially when one hears it for the first time on the opening track, Stand and Fight. That's mostly an illusion, though; the song simply requires a lot of growling and Leone obliges, though on the cleaner parts she is pretty clearly having to put in a bit more of an effort than she used to have to do. The song itself reminds me a little of something off the Ruler of the Wasteland album, now with cleaner production and a more distinct pairing of the guitar with the vocals. By Call of the Wild, which has a similar, medium-to-fast rhythm, it's a little easier to appreciate the slightly-updated Chastain sound, and the third track, Deep Down, which changes melodies partway through from what sounded like it was going to be a fairly standard tune from their past to a more interesting bridge with cleaner vocals. Chastain's riffs and solos haven't changed much from the 80s; if anything, they have returned to their roots since the Kate French albums, where his guitar always seemed to be flatter and smoother. The riffs are mostly pure galloping speed/thrash, with plenty of melody interspersed with smoothly bending, twisting runs up and down the fretboard, though occasionally (and this may be the production) one now hears what might be interpreted as a slight groove influence in some of the heavier rhythm passages, especially in I Am Sin. The other thing I noticed about this album is the drums; there seems to be a good deal more drumming in all the songs than the simpler beats present in the 80s-era albums, and they are given more of an emphasis in the mix. Rise Up and Evil Awaits Us have plenty of nifty shredding on them (it starts immediately on Evil Awaits Us), but the bluesy, briskly-stepping pieces like Fear My Wrath sound better, mostly because one hasn't heard the band use a beat like this one much. Songs like Angel of Mercy and (less quieter, I know) Mystery of Illusion were good for their previous albums, but this time it seems like almost everything has a quick tempo and lots of pounding riffs, including the title track, which seems as if it may have some Manilla Road influence, particularly on the verses (as does the chorused clean riff of Save Me Tonight). The most unusual song is the last, Bleed Through. An initially soft song starting only with some synth and Leone's voice blasting away with almost no modulation (she quiets down every once in a while, but not much), it moves on to deep, palm-mute-punctuated riffs from Chastain, almost tuneless. It doesn't sound much like a normal Chastain song, and I can't help but wonder if this is the result of the Leone/Chastain collaboration for this album that was getting talked about, or if Chastain just decided to try something different at the end. Surrender To No One isn't a groundbreaking album -- it pretty much takes up where For Those Who Dare, Leather Leone's last album with the band, left off. But it's still good, and quite listenable. David Chastain hasn't lost any of his ability to write 80s-style songs, and though Leather Leone's voice is a little grimmer, fiercer, and certainly an acquired taste for newcomers in a modern age of sweet, opera-influenced female vocals, fans of Chastain and of Leone's and Chastain's individual work are likely to enjoy this one.